This recent severe drop in temperature has been a quick reminder of what a typical South Dakota winter is usually like. We have had such mild winter weather thus far that it was easy to pretend winter just wasn't coming. Needless to say this cold is not very conducive to working on the car in a non-insulated garage. However it does allow ample time for research, which is what I have been doing this past week. I want to be able to do as much of the restoration work on my Trans Am as possible. What I am not sure how to do I intend to learn, which is why I knew I needed some sort of guide or instructions. I have heard from multiple sources that the Hayes and Chilton manuals are really worthless if you are seeking anything other than just the most basic information. 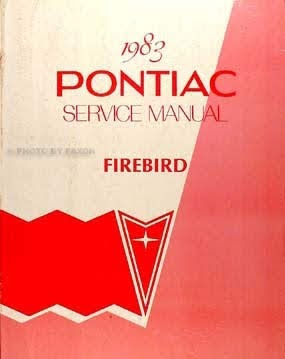 So I set out to find the GM Service Manual for the 1983 Firebird line. I had previously stumbled across a PDF copy of the 1988 Firebird Service Manual and promptly downloaded it. It is amazing the level of detail that goes into a book like this. Not surprising though considering this is what the techs at the dealerships use to work on the vehicles. Faxon Auto Literature had just what I was looking for. A 1983 Pontiac Firebird and Trans Am Repair Shop Manual in very good to excellent condition. It has detailed service procedures for heating, air conditioning, frame, bumpers, steering, suspension, wheels, tires, propeller shaft, differential, brakes, engine, cooling system, fuel system, electrical system, emission control systems, exhaust system, transmission, chassis and accessories. There is also body service, electrical troubleshooting, maintenance and lubrication. Each of these sections has step-by-step illustrated instructions, specifications and wiring diagrams. It will be the perfect guide to restoring my Trans Am. While searching for the service manual I came across a F-Body Parts & Illustrations CD at fbodycd.com The CD contains the exploded view diagrams of parts and assemblies, along with their original GM part numbers. The Firebird CD covers the base models and all variations such as TA, TTA, SE, Formula, etc. Each part in the diagram is numbered and is listed in a corresponding parts chart either right below the diagram or on the next page, so you can look up the correct name for your part. With these two resources at my disposal there should not be much that I cannot restore, repair and maintain on this car. I am really excited about the exploded views on the parts CD. It should make it so much easier to visualize and properly identify parts and corresponding replacements.